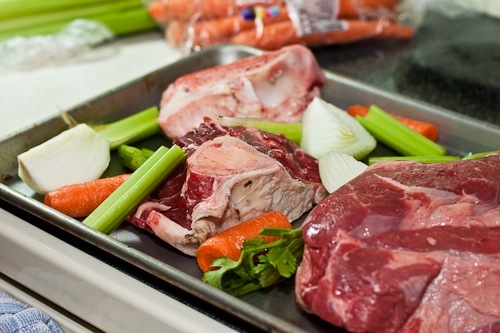 Braising meat on the stove for a good long time will really warm up my kitchen. The condensation from all that braising liquid will freeze my patio door shut, and my dog will invariably need to go to the bathroom at that exact moment. When my dog really needs to go to the bathroom, she will use her cold nose as a weapon to get me up off the couch. It’s a long, cold walk through the unheated garage to the other backyard door. I really need to make sure the children are out of earshot before grumpily threatening to sell the family dog on eBay. If you’ve been dying for a recipe good enough to freeze your patio door closed, look no further! If you haven’t, or if you are one of those extremely annoying people who live someplace where the thermometers don’t even have temperatures below 32°F marked on them, I suggest you stick around anyway. I promise you, it’ll be worth it. This recipe will take care of dinner on the first night, and make a great soup for lunch or dinner the next day. 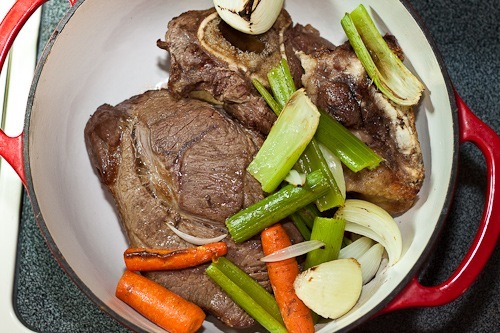 You’ll need some beef, beef bones, various vegetables and a broiler. A little time under the broiler makes the magic happen. Boil for a ridiculously long time and you will be well rewarded. Check out that broth. Yes, it really was as rich and beefy as it looks. 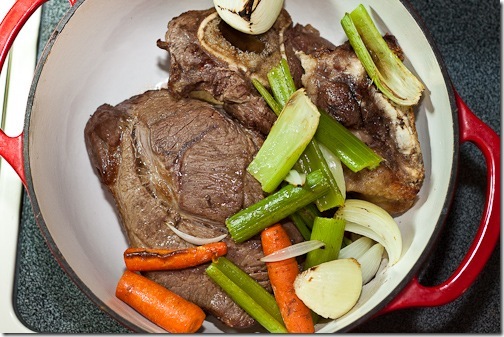 Place the beef, beef bones, onion, carrots, celery and garlic on a roasting pan or rimmed cookie sheet. With oven rack about 6 inches from broiler, broil the beef and vegetables for about 5 minutes per side, flipping once. 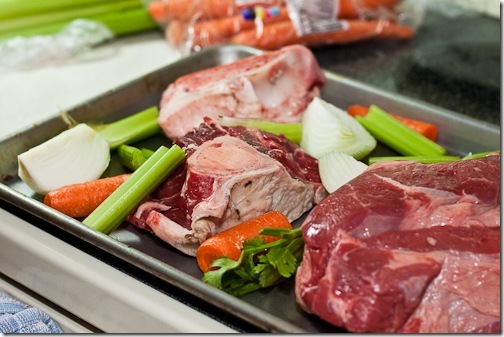 The meat and vegetables should be nicely browned, but not cooked through. 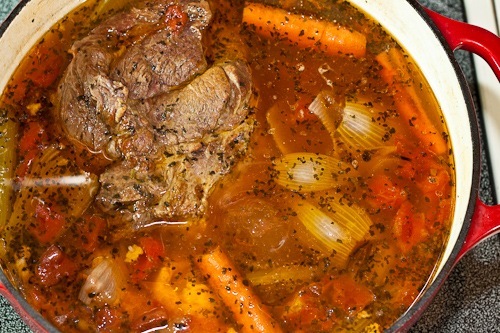 Place the roasted meat and vegetables, and the remaining ingredients in a heavy pot or Dutch oven. Bring to a boil over high heat, then reduce heat to medium low and simmer, covered for about 3 hours or until meat is pull-apart tender. Remove the meat and slice thin or chop. Strain remaining the stock through a fine sieve or double layered cheesecloth, I use a cotton cloth. Discard the vegetables and beef bones. Reserve one cup of broth and store the remainder in the refrigerator to make stracciatella soup (Recipe coming soon to a blog post near you). 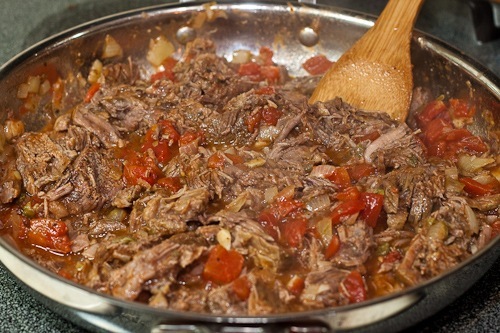 The boiled beef is traditionally served with various condiments such as salsa verde. But since I’m about as traditional as burgers and fries on Thanksgiving, I decided to do things my way, as usual. Sometimes this works out wonderfully. Sometimes – not so much. Just ask my husband. If you Really, REALLY feel the need to do things the old fashioned way, this recipe for salsa verde from Whole Foods is really quite good. 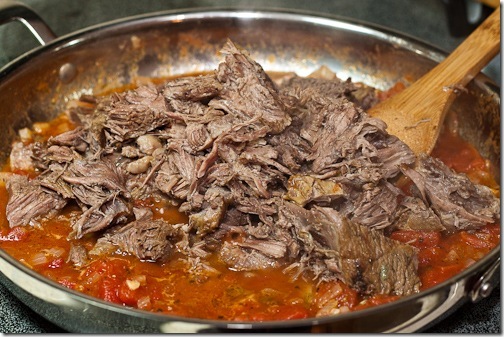 If you’re feeling a bit more adventurous, scroll down for my Italian Boiled Beef with Tomato, Anchovy and Caper Sauce recipe. It also has crushed red pepper flakes which are absolutely essential, since they help to defrost the windows. I served this over Polenta, but you could also serve it with a penne or tagliatelle pasta, if you really want to go there. The essentials. Without them the sauce is nothing. Less than nothing. Like, negative even. If you really like the salty, fishy taste of anchovies, feel free to use 2 or (gasp!) 3 fillets. Mince ‘em up fine. If you are feeling especially daring -and you don’t have children that hate them with a passion only a preteen can muster- you might want to add in some black olives. 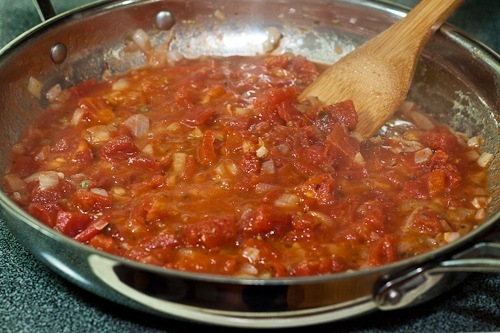 Heat the olive oil over medium high heat in a large, heavy bottomed skillet. Add the onion and cook until softened, about 5 minutes. Add the garlic and cook for a few more minutes. 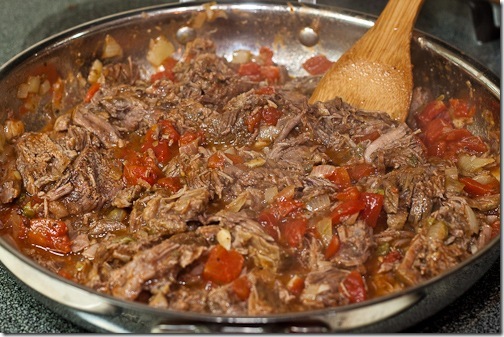 Add the remainder of the ingredients, except for the boiled beef. 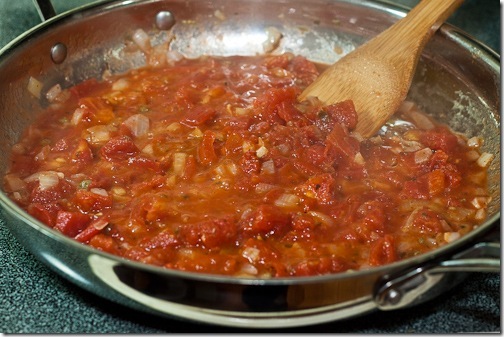 Bring to a boil, then reduce heat and simmer uncovered until sauce has thickened, about 10 minutes. Stir in the boiled beef and simmer until heated through. 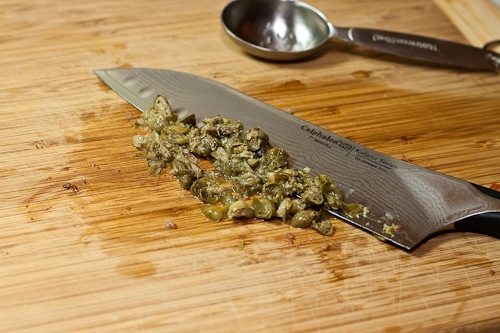 Taste for seasoning and serve over polenta or pasta. I have never seen beef done in this application before and it looks fabulous! Definitely a way to warm up on a cold night. We could use a recipe like that around here (Alberta, Canada)….it’s been -35 for the last few days! Definitely chills you to the bones. But this recipe sounds like the perfect remedy. LMAO over your “lessons learned”, those were hilarious. Great looking recipe. 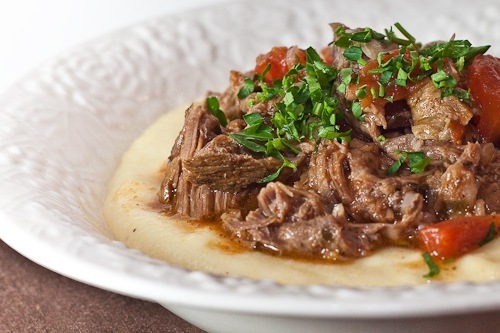 I think braised beef is a winter antidote. what part… I am in western Kansas City KS suburbs??? I think I will be trying this very soon, might help cure the winter blues. Great post as always Karen, and glad you’re back. I was about to send out search and rescue. Love love love your lessons learned! I would never EVER doubt you on #4. Being a native I have that same understanding. This beef looks WONderful. 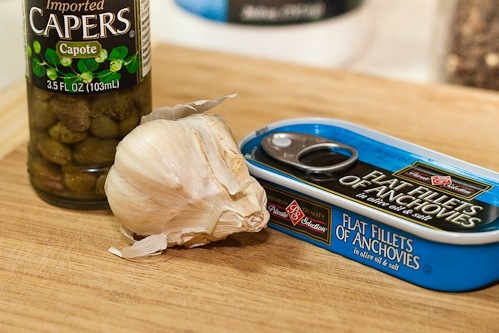 I love that anchovy and caper sauce. This whole recipe is so different that I have to give it a try. LOL…I saw this on Tastespotting…I loved your list-of-eleven 🙂 I once threatened our dog that I was going to send her to a farm–I didn’t know my kids were within earshot. Oops. 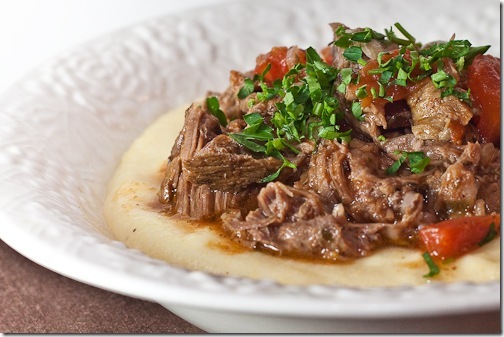 🙂 This looks so good, and I love that you served it over polenta. Polenta is one of my favorite things, and I’m amazed at how many people have never had it, or worse , don’t like it. Boggles the mind 😉 I may even try anchovies for your recipe–maybe 😉 Thanks! 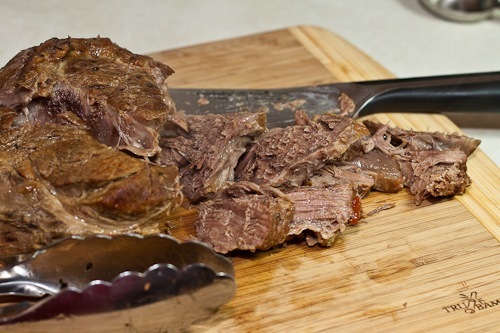 That beef looks so nice and tender and flaky and good! 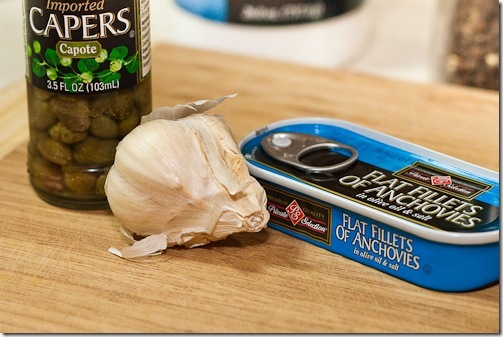 oh, yes…definitely prefer the version with anchovies, capers and black olives! Great recipe. The Meal Planner: It’ll definitely warm you up on the inside and the outside 🙂 Though I’m not sure how much good it will do you in Alberta in January! Chris: Just make sure you have better windows than I do, or that you don’t need to open them anytime soon! Paul: Let me know what you think when you do! Tiffiny Felix: It’s amazing how the kids are always exactly where you don’t want them do be, just when you’re saying something you don’t want them to hear! 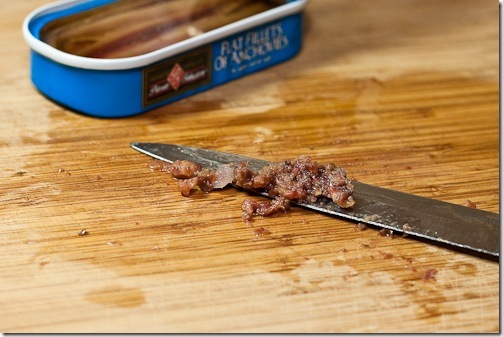 If you don’t like the anchovies, you could always add about a teaspoon of Worcestershire to give it some kick . Kevin: It is. And it makes a great sandwich too! Oh, what I would have given to have had this recipe few weeks ago…when blizzard was outside and the only thing keeping me sane whilst walking from uni to public transport station was thought of a hot meal when I get home. In the end I made onion soup 🙂 but this is definitely getting printed out and posted on refrigerator for next cold, cold day :D.
Ali, I love me some onion soup! I hope it was the gratin kind, with lots of melty cheese. 🙂 I don’t know about your neck of the woods, but we have had more than our fair share of cold, cold days this year. I hope that this dish will be a consolation prize for you when the next one rolls around in your area! hey karen, just found you blog, such fun, have been stuck in front of the computer all morning, nothing done, but they will have a great dinner this evening thanks to your boiled beef recipe. looking forward to reading on. will make a change from the traditional way of doing it.